I really can't complain. It's the first week of November and there are still tomatoes ripening on the vines in the garden. Can you believe it?! And just this morning when I walked out there to pick a few, I found a brand new blanket of tender, baby arugula, planted by the seeds of last spring's plants! Naively, they bask in the sunshine, oblivious of what's to come. Yet, the trees - wisest in the botanical kingdom - know it's fall, even if the temperatures say it's still summer. Their golden leaves cling to the branches, knowing these pleasant days won't last. I've lived in Colorado long enough to know that when summer stretches late into fall, winter will be fierce and spring, cold and damp. So I tell myself to savour each and every warm day. But deep inside I'm longing for the cool, crisp days of fall - for apple cider, for sweaters and boots and scarves, for late nights with friends around the fireplace, and for early mornings when the trees are frosted in fine, powdery snow. In fact, I want it so badly I've been dreaming of it. Strange & wild dreams. Like that old Christmas song - it will be fall, "if only in my dreams." It was a beautiful fall morning at the farmers' market. Impossibly high heaps of the season's finest produce were stacked in the farmers' stalls: local apples, large and round in the most vivid shades of yellow and red; delicate Forelle pears of mottled green and maroon rubbed shoulders with the more distinguished Bosc - my personal favourite - like gentlemen and ladies at an evening soirée; aromatic mounds of fresh herbs - bunches of thyme, branches of sage, bouquets of lavender - were tied in ivory kitchen twine like Christmas presents waiting to be unwrapped; and the last of the season's tomatoes, many damaged by hail a few weeks ago, were made all the more beautiful by their scars. They'd make a lovey marinara sauce, I though as I walked by. But something caught my eye. In the distance, on the last table were mountains of gold, piled high into the sky! As I walked closer I realized that the piles of gold were, in fact, the most beautiful yellow onions - yes, onions can be beautiful, too! Perfect - their skins, fine and smooth as glass, were shining in the golden rays of sunlight. Behind them stood a friendly man with a big white beard and red suspenders. I felt sure he must work as Santa Claus in the off season, he had that certain twinkle in his eyes. Finally, the bag was full and I press some money into his cracked and calloused hand, but the onions didn't look quite like gold anymore. It's just a trick of the light, I decided, looking around at the wisps of fog that were snaking between the market stalls. But in fact, the onions looked an awful lot like lead. And that's exactly how they felt as I tried to hoist the bag onto my shoulder. It was so bizarrely heavy that I almost couldn't lift it off the ground! By now the fog was so dense that I couldn't even see the other produce stands at all. It was just me, alone with the bag of leaden onions in the swirling, silent mist. Then from somewhere off in the distance I heard the clip-clop of horses' hooves. Suddenly, just behind my right shoulder, the snort of a huge horse blew my hair in front of my face. I turned to see a horse-drawn wagon - you know, the kind they use for children's hayrides. I climbed up into the hay, onions and all, and the horses took off through the fog. Here and there I caught flashes of orange in the mist as I clung to the side of the wagon. It was moving faster and faster now! Until, through the haze, I was just able to make out the orange shapes. Pumpkins! 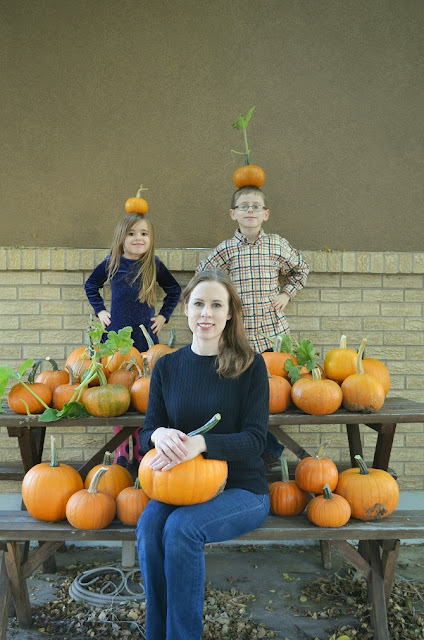 Small, perfectly round sugar pumpkins! Wide, elegant Cinderella pumpkins! Crimson Kuri Squash! Hundreds of them! We were driving through a pumpkin patch! I reached out to grab one but it was just beyond my reach so I turned to ask the driver to stop. But when I look up, there was no driver. In fact, there were no horses, no wagon, no hay, no bag of onions. It was just me again, and wispy billows of sheets and pillows around me. The sun was streaming through the curtains, painting the bedroom gold. There's still a little hope that fall will arrive before winter... But according to the news, winter may arrive next week. So, if nothing else, I'm enjoying fall anyway. If only in my dreams. I'm not a big pumpkin dessert fan, but I do love it in savory dishes. This is a mix of both. 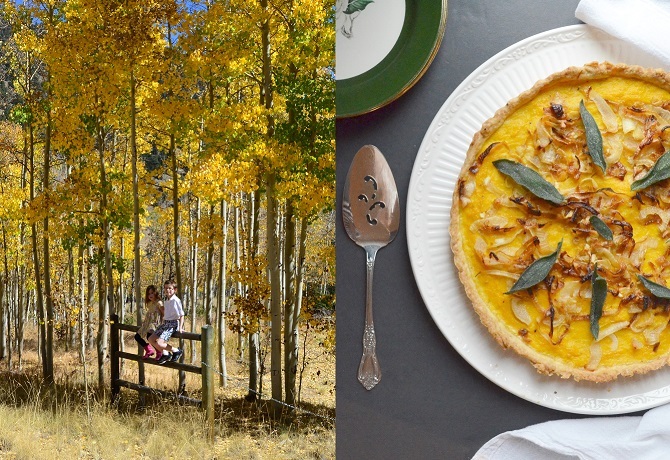 A savory pumpkin filling, topped with sweet caramelized onions and crispy sage leaves. The crust is slightly sweet with a surprise inside - aromatic anise seed makes you feel like you're eating dessert for dinner! Mix together the flour, sugar, anise seed and salt. Using a pastry blender, cut the butter into the flour mixture until evenly distributed. Add the yolk, water & vinegar and continue mixing with the pastry blender until the dough comes together. If it seems too dry add a little extra water, a few drops at a time. Press the dough into a disk and wrap in cling film. Refrigerate for at least 30 minutes before rolling out. 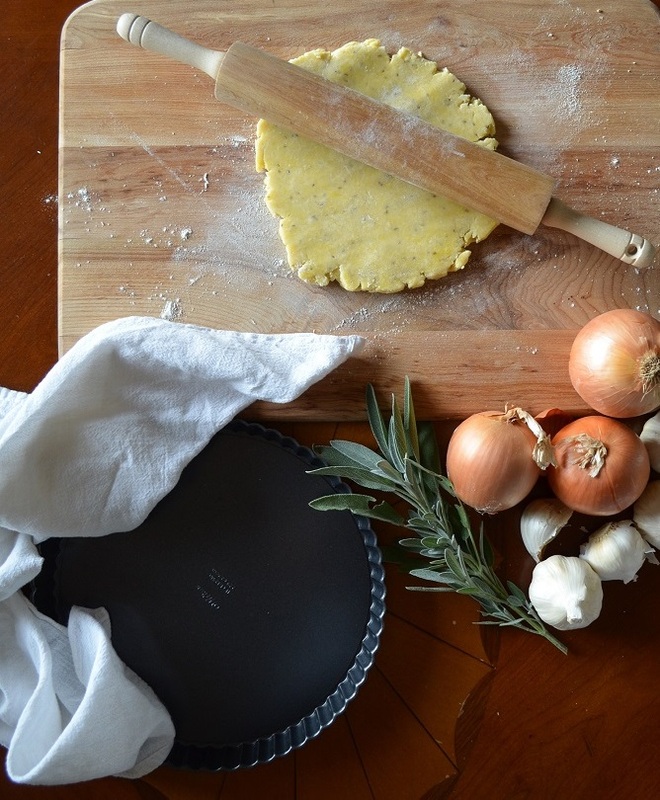 When ready to bake, spray a tart pan with removable bottom with non-stick spray. Roll the dough on a floured surface and place it in the pan. Fold any excess dough back into the pan and press into the sides to reinforce the tart shell walls. Place in the freezer for 15 minutes. Meanwhile, preheat your oven to 375 F (190 C). Prick the bottom of the tart shell all over with a fork, then line the crust with aluminum foil and fill with pie weights or dried beans. Bake the tart for 15 minutes then remove the foil and weights and bake another 15 minutes or until lightly golden. Allow to cook slightly before filling (but don't turn off the oven). In a skillet over medium-low heat, caramelize the onions in the butter with a pinch of salt until golden, about 20 minutes. A minute or two before you take them off the heat, stir in the garlic. Don't let the onions get too brown, they will continue to caramelize in the oven. In a large bowl, whisk together the pumpkin, eggs, cream, salt & pepper until smooth. Spread the pumpkin mixture in the bottom of the baked tart shell. Evenly sprinkle the onions on top. Place back in the oven and bake for 25 - 30 minutes, until the center of the tart is set. While the tart is baking, fry the sage leaves. Heat the olive oil in a small skillet. Working one at a time, drop the sage leaves into the oil. Fry for 2 seconds on each side and remove to a plate lined with paper towel. Sprinkle fried leaves with salt. 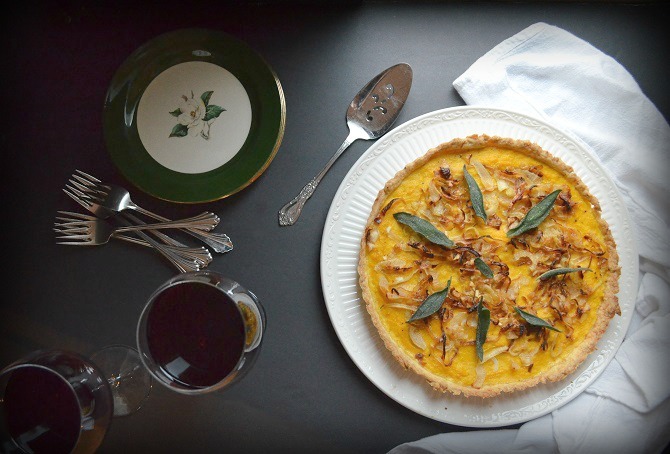 Top the tart with the fried sage and serve warm or at room temperature. 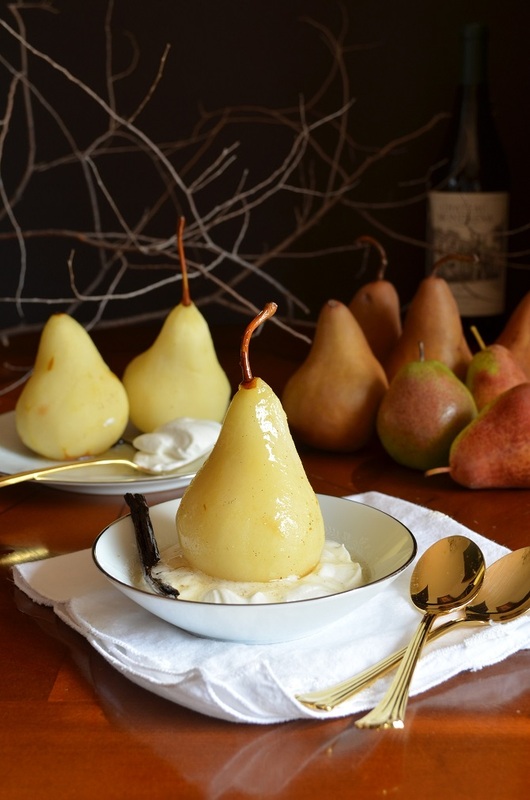 Poached pears are my go-to dessert when we have company! They're so easy, can be made well in advance, and just the thought of eating fruit for dessert makes me feel healthier, even if it is served on a decadent bed of cream! The flavor of cardamom is laced throughout this dish, from the poaching liquid to the whipped cream. In years past, cardamom was thought to be an aphrodisiac - and it has the very unique ability to warm the body if cold, or cool the body if hot. Sounds like the perfect fall dessert to me! Peel the pears, but leave the stems intact. In a sauce pan just big enough to fit the pears, mix the wine, water, sugar, vanilla bean, and cardamom. Bring to a boil. Carefully place the pears in the poaching liquid. Simmer very gently for 10 - 12 minutes. Remove the pears with a slotted spoon and set aside to cool. Bring the liquid to a rapid boil and reduce to approx. 1 cup. Discard the vanilla bean. Meanwhile, whip the cream with the cardamom and powdered sugar. To serve, place a dollop of cream in small bowl, top with a pear and drizzled with the thickened syrup. 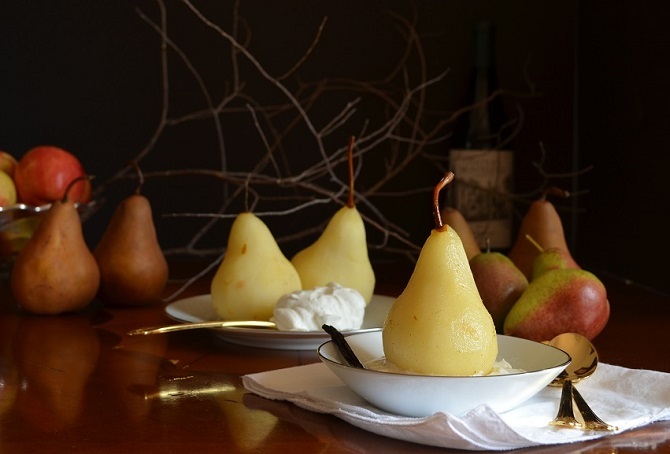 Pears can be served cold or at room temperature.